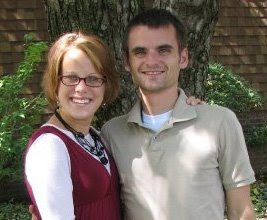 Nate Zuck, former director of small groups at the Winona Lake (Ind.) Grace Brethren Church (Bruce Barlow, lead pastor), is completing training at the FAA Academy in Oklahoma City, Okla. When he graduates on Friday (December 5), he and his wife, Joanna (both are pictured above), will relocate to the Cleveland, Ohio area where he will work as an air traffic controller at the Cleveland ARTCC (Air En Route Traffic Control Center). Nate, who with Joanna hopes to develop a ministry among air traffic controllers, is in the background of news story on Good Morning America (ABC News) about the air traffic control school. Click on the video above to see the report. Also of note is that Joanna is the daughter of Dan and Lois Gillette. Dan is pastor at the Grace Brethren Church in Covington, Va. Both Nate and Joanna are Grace College grads.